In this Canbor VR headset review, we will cover all the important details of Canbor’s unique and affordable headset. Listed at just $35.99, the Canbor headset has been around the top of Amazon’s best-seller lists for months on end. Many VR enthusiasts are skeptical of ultra-affordable headsets, but does this device break the mold? This Canbor VR headset review will cover the design, visual performance, audio performance and unique features of the popular VR device. The Canbor VR headset is a unique device that appeals to those looking to get their feet wet in the VR scene. Foam padding that is comfortable and reduces outside light. Comfortable straps that distribute the device’s weight evenly across the head. A storage slot for phones with screens between 4.7 and 6.2 inches. Adjustable lenses for people with different viewing preferences. Pre-packaged accessories like glass wipes and rubber strips for blocking your phone’s buttons. At $35.99, it’s about half the price of similar headsets. It’s built with durable materials — it does not feel cheap. It Ships with a QR code for the Google Cardboard app. It’s Great for YouTube videos and first forays into virtual reality. While durable, the device is incredibly cumbersome. It’s prone to overheating — you’ll probably want to keep a cooling pad on your phone during use. There are many horror stories regarding faulty devices; there’s a distinct possibility your headset will ship with a defect. Lens quality is on the lower end, and adjustability of lenses is limited. No one expects an ultra-affordable VR headset to boast a breathtaking design. The Canbor VR headset looks exactly like a $35 headset should look: it’s clunky and rough around the edges. It also weighs about as much as a brick. The good news, however, is that the materials it’s designed with are of impressively high quality. The plastics and leathers feel durable and account for the device’s weight. Its straps are also designed to effectively dampen the burden of the headset’s immensity. A magnetic lid pops off the device’s back-end opening a space for your phone. This design is ambitious, but one Canbor VR review after another has pointed out the temperature issues it causes. The corridor is simply too tight for natural cooling. To make matters worse, the headset’s marketing materials do a poor job of describing the phone sizes that work with the device. Phones with screens over 6.2 inches will not fit. Though design and other quality-of-life features are important, the true test of a VR headset is its visual performance. This is luckily the strongest category for the Canbor VR headset. The headset easily outclasses the cardboard headsets in the price tier below it, and it tries to compete with more expensive devices like the Samsung Gear VR. 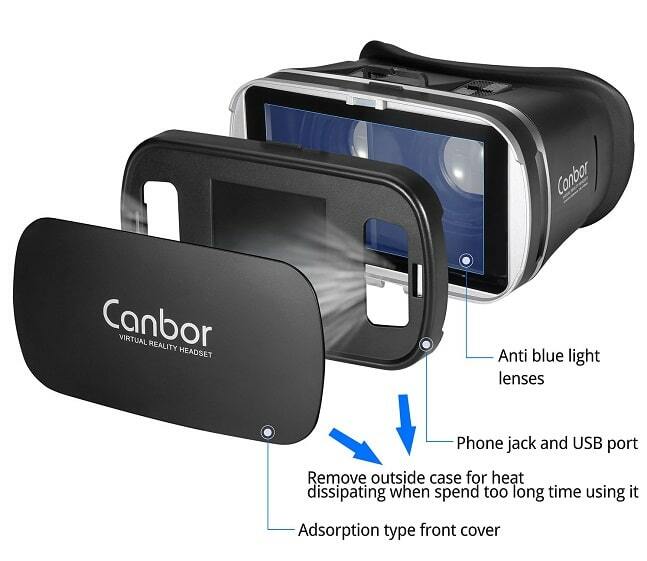 The Canbor VR headset is the least expensive device to offer adjustable lenses. You can purchase this device with some level of confidence that you’ll be able to adjust it to fit comfortably — or work at all. However, as with any entry-level lenses, your mileage may vary. The worst part about the device’s visual performance is the gap between the lenses and the phone screen. While this isn’t necessarily a deal breaker, it adds an unpleasant layer of distance from the video. It’s like sitting towards the back of the theater. As a result, the device is best used only for watching movies and videos. Games can be tricky to play on a device like this. The newest models of the Canbor VR headset feature built-in audio. This feature probably accounts for the $6 increase in price from previous models. This essentially equates to the device’s new headphones being worth a total of $6 at most. As a result, you can’t expect the finest in 3D sound. These headphones are best thought of as a quality-of-life feature. Canbor elected to create a device with built-in sound to eliminate the requirement of other headphone peripherals. When judged accordingly, this is a basic pair of headphones that warrants little praise—but no complaint. It’s difficult to fit controller functionality into a Canbor VR headset review. The controller scene for mobile VR is like the wild west right now. Unlike its PC and console counterparts, mobile VR is bogged down by the poor quality of third-party peripherals. The Canbor VR headset works with all major Bluetooth controllers, but whether you’d really want to use any of them is a different question entirely. Fortunately, the Canbor VR headset does work well with the Canbor VR remote controller. This little device is perfect for performing basic tasks such as adjusting your phone’s volume, switching between apps and videos and more. Since you’ll likely be using your Canbor VR headset primarily for watching videos, the lack of good full-range Bluetooth controllers doesn’t hurt it very much. Throughout this Canbor VR headset review, several references have been made to the device’s inability to support a true VR gaming experience. This does not boil down to the lack of any individual feature. Overall, the Canbor VR headset is a poor device for gaming. 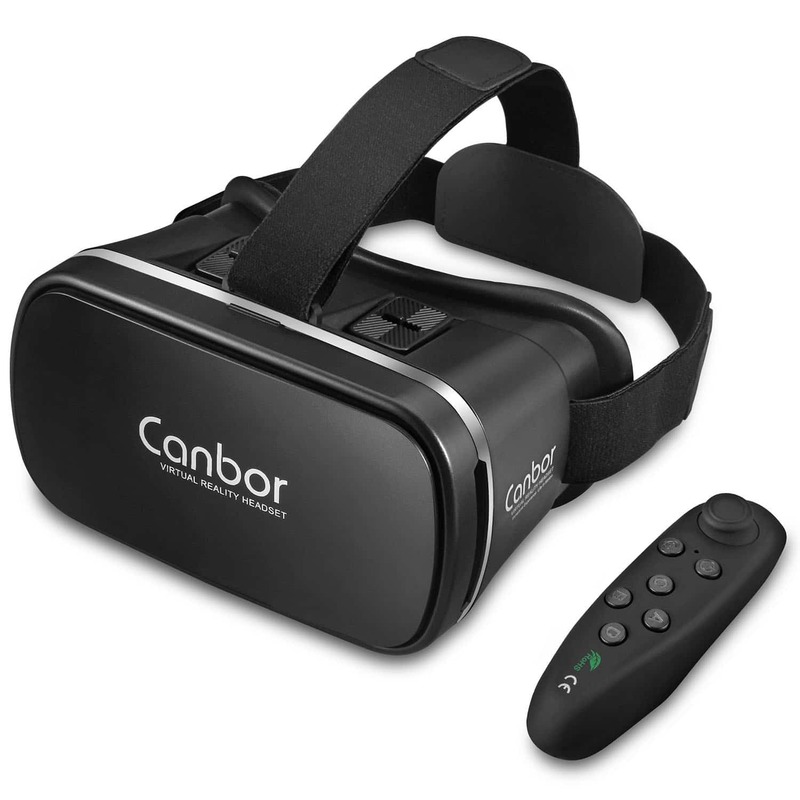 The most immersive VR apps available on mobile devices do not shine on the Canbor VR headset. If you intend to play games, it makes a lot more sense to purchase a headset in the next price tier. For just $30 more, you can experience a well-optimized device like the Samsung Gear. The Canbor VR headset outperforms every cardboard headset on the market, but the praise ends there. This Canbor VR headset review has explained the strange position the device currently sits in; it sits just above the bottom in terms of what’s available in the mobile VR market. Those looking for an entry-level device to play around with may even be better off with a cardboard headset. Those looking for anything more are certainly better off investing an extra $30 on something better.